Dril-Quip Tests New DXe™ Subsea Wellhead Connector without Assembly Bolts. The subsea wellhead connector is an integral part of a critical connection made between the subsea BOP Stack and the wellhead. Historically connectors used in the industry have a load path that drives the applied preload with the wellhead through a series of bolts required for component assembly. Since 2003, there have been a number of bolt failures on subsea drilling equipment, and U.S. government agencies are involved and industry task groups have been formed to evaluate bolt material and coatings to address the problem. 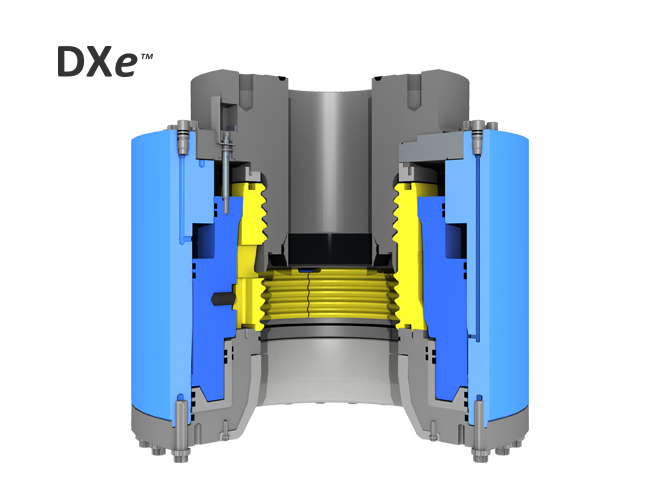 Dril-Quip’s new DXe™ Connector design solves the problem a different way, by moving the load path away from assembly bolts. To demonstrate the connector’s ability to stay locked and contain full working pressure (20,000 psi) without assembly bolts Dril-Quip performed a series of load tests following the latest API 16A specifications with impressive results. For the results, click here and download our catalog.